According to The Daily Mail Online, the teddeh bears shown below are "the first soft toys to take part in extra-vehicular activity... at such an altitude." Check out Bear Armstrong and Nose Aldrin here. According to the story: "The teddy bears had to endure temperatures of -53C but had special spacesuits made by school children from the nearby Parkside and Coleridge community colleges." The Ted-astronauts weren't ALL about fun and games. 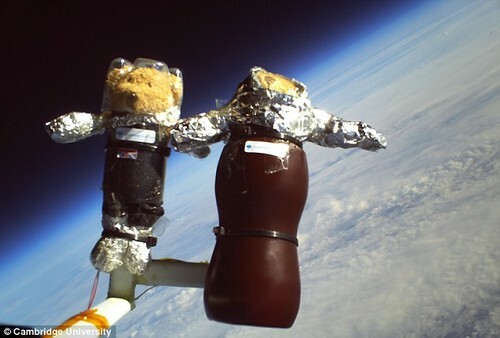 Scientist Henry Hallam, 21, said: 'We asked the children to build the space suits for the teddy bears and we monitored the temperatures inside and outside the suits. 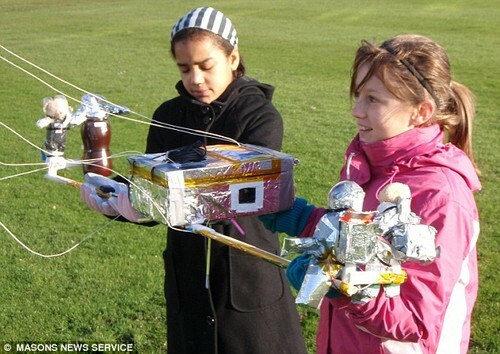 It was great to involve these young people so they can learn about physics in a different and exciting way." This bear threat-down brought to you by Mail Online, sent in by the uber-fabulous Vicki O.
Hooray for creative science teachers! Hooray for Physics! Teh teddy on the right's nose looks dangerously exposed. OMG Katie that is exactly what I was going to write! So sorry about the duplicate post -- bad case of itchy post/trigger finger, I guess. Children in community college? Do they call grade school college in Britain? Very cute, only to be expected from the homeland of Paddington. Ted on left, doesn't look too happy. "Tin foil and a lemonade bottle, I was expecting something more high tec." 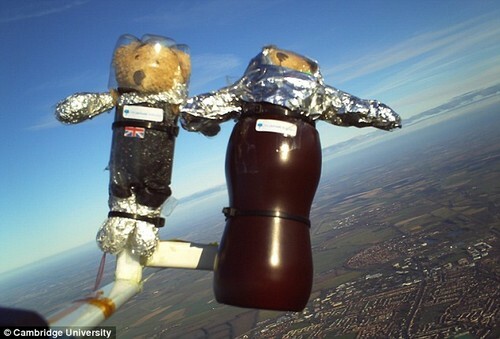 Oh, Hon Glad, I don't know, it looks rather like Ted on Left has not only cold insulation, but a space helmet so he can breathe in the altitude. He's just very serious about his part in the assignment. It's cute that the bottle makes it look contoured for his ears! Anna, college in the UK refers to something like high school...the kids would have been from 13 or so up. Sometimes I love my university so much I could burst. Go light blue! Best hovertext ever: "Thanks for the tin foil, kids." Major Nom, geeeeeeeeeeeeeeeesh. That's actually really funny. That's one giant leap for bearkind. "Wow, I can see my house from here." "Crap it's cold!" Pyrit, I must have had some of that tea too, because I certainly don't see any of that nonsense either. More, please? @Theo: We can beat the Delta Blues in rowing, but we'd lose to them in introspective melancholy. You're right Theo, it is MF Brew Time. I'll put the kettle on. But, light blue? How about "GO Ceruleans, GO!" But as Cambridge was founded in the 13th century, I suppose the tradition has already gelled somewhat. Beckymonster-yes, it should be. Niiice one. Groaan. I would also like to point out, that the bears made it back to earth safely!!!! It's more of a greenish-blue. But we still own the Nobels. And Oxford blue...well, it's so dark as to cover up the food stains. True fact. Very cute. But I'm gonna give a major shout out to science geek girls!!! Huzzahh! Please refrain from posting this stuff,keep the real cuties not stuffed animals and kids stuff. Boring!!!!!!!!!!!!!!! Klingons on the starboard bow! That's pretty cool. It's not as cool as "Pigs In Space," but it's still pretty cool. If you're too nuffy do YOU become the nuffer? That is adorable and heart warming! People who say kid stuff is boring, nertz to you! and so has the major tom comment..I guess I need a spot of that tea pyrit is brewing. NOt just a nuffer but a stuffy Nuffer.. There can be nothing worse. Is that last pic real? Looks real but how can those things survive in zero gravity much less the movement through the upper atmosphere. Too cute!! How about a nuffer stuffer? I'd rather be a puppy huffer. I didn't know NASA stood for Nuffing Airborne Stuffed Animals! The stuffy Nuffer's nuff was not nuffy enough. The the stuffy nuffer's nuff wasn't nuffy enuff.